The SD200PC is a sleekly designed product with outstanding performance, reliability and quality that will save you 100’s of hours in production time and 1,000’s of dollars in production costs. With user friendly software interface and powerful copy features, you can copy to 20 blankSD flash memory cards, simply and automatically. No “copy-n-paste.” No single card loading. No hassles. 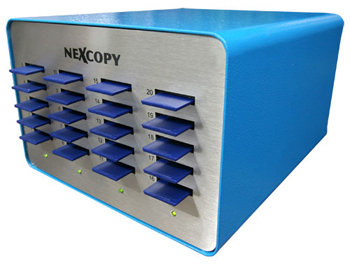 The unit is a PC Based SD Duplicator device capable of copying at maximum data transfer speeds. Why is the SD200PC a benefit to your company? In-house deployment. With the SD Card Duplicator, deployment of your software application to field devices will be a quick and painless process. Security. It’s the number 1 issue with corporations today, the SD Duplicator gives you control over the production process. Safeguard your intellectual property by knowing when and where the data was created and distributed. Imagine the possibilities. Since Secure Digital media is one of the most popular memory types, it’s ideal for use with Mobile Phones, GPS units, telecommunication devices and embedded applications which run off SD flash memory.